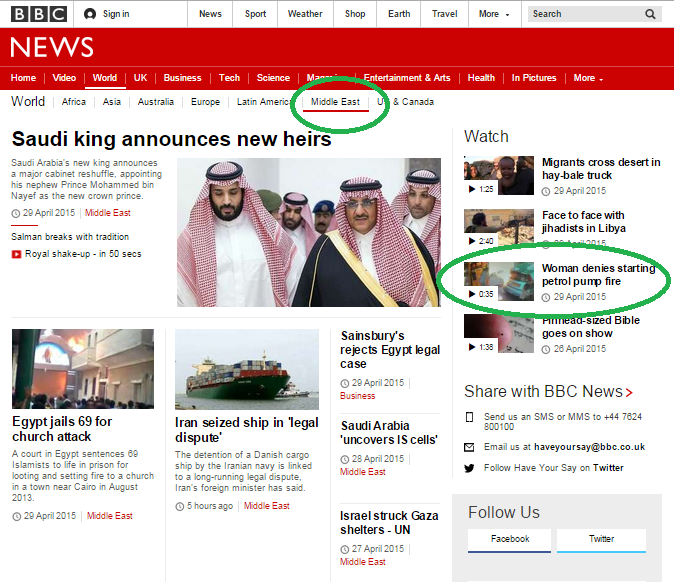 On April 29th visitors to the BBC News website’s main homepage were presented with a video filmed in Jerusalem. The BBC also uploaded the same video to its BBC News Youtube channel. 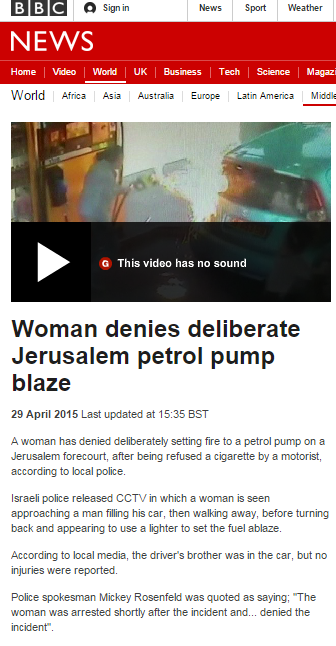 “A woman has denied deliberately setting fire to a petrol pump on a Jerusalem forecourt, after being refused a cigarette by a motorist, according to local police. Israeli police released CCTV in which a woman is seen approaching a man filling his car, then walking away, before turning back and appearing to use a lighter to set the fuel ablaze. According to local media, the driver’s brother was in the car, but no injuries were reported. 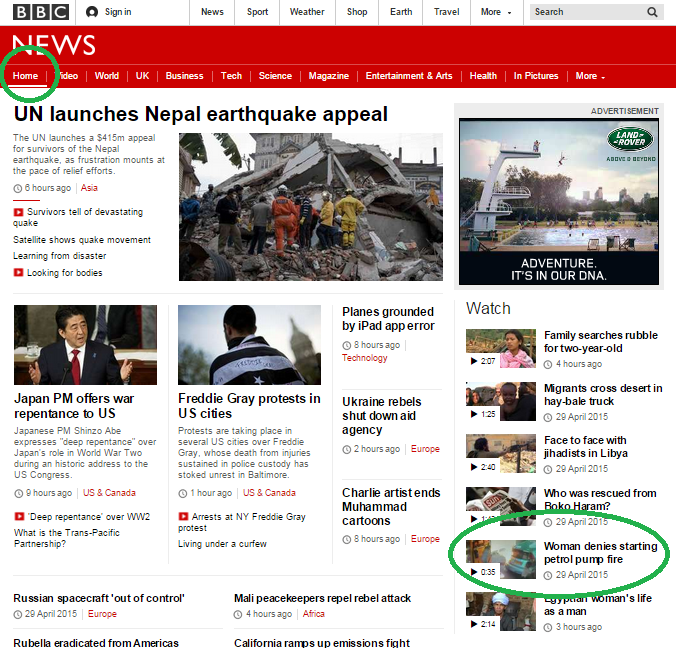 BBC audiences are not, however, informed that the woman apparently suffers from mental health problems. 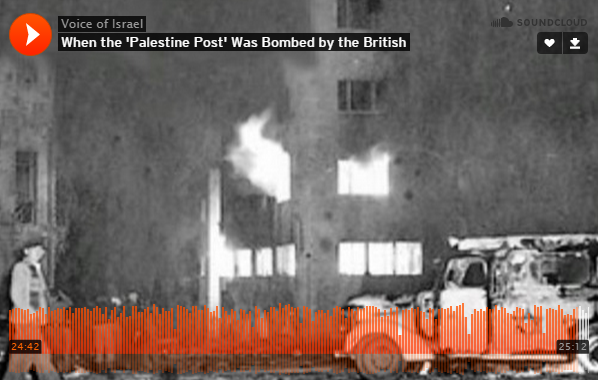 Another video taken from CCTV footage in Jerusalem was also released into the public domain on April 29th. That film shows the terror attack which took place in the French Hill district of the city on April 15th in which one person was killed and a second seriously injured. As readers will recall, the BBC did not see fit to report on that fatal terror attack at the time and the corporation obviously does not consider the video footage of the attack worthy of promotion on three separate webpages and a Youtube channel now. “In its summary of the Blackley and Broughton constituency ahead of May 7, the broadcaster describes a multi-cultural area containing a ‘Jewish community concentrated in a wealthy pocket of large detached houses’. Labour candidate Graham Stringer, who is defending the seat, says the words have prompted a flood of complaints from Jewish people. He said parts of the area’s Orthodox community suffer from some of the highest poverty levels in the country and compared the description to the Victorian caricature of Fagin in Oliver Twist. In a complaint to the BBC, he says the description is a ‘racist distortion’. The profile refers to Blackley and Broughton’s Muslim, Irish, West Indian, Sikh and Polish populations and points out that a third of people in the constituency live in social housing. By way of comparison, the constituency which the BBC defines as “the richest place in Britain” – Kensington – is described as “well-to-do” and no mention is made of its ethnic or religious make-up. The BBC has now amended the profile of Blackley & Broughton. Once again the BBC chooses to miss the point. “The 50-day conflict claimed the lives of more than 2,260 people. 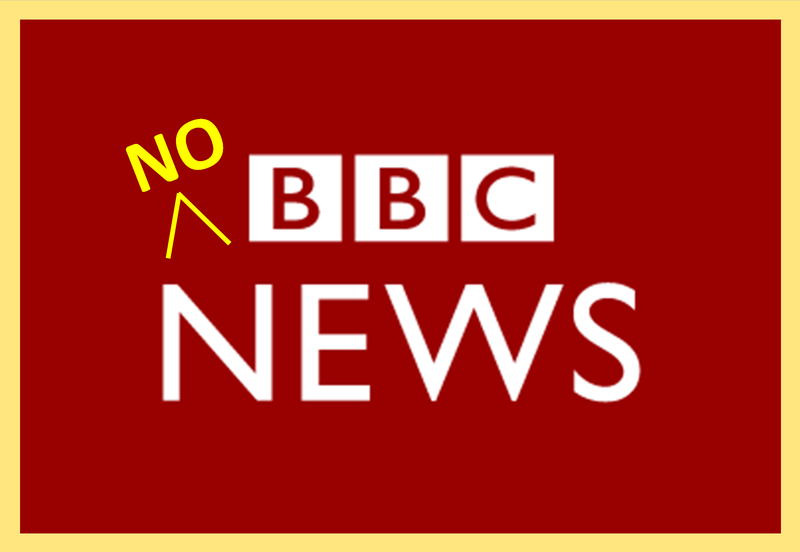 Since the BBC began using that terminology back in December 2014, further information has come to light concerning the ratio of civilian to combatant casualties but the BBC continues to ignore those findings, instead continuing to quote the UN figures which were problematic from the onset and with nothing to suggest that the BBC has carried out any sort of independent verification of the information it promotes. 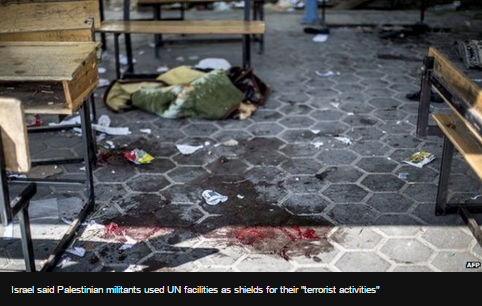 An additional part of the BBC’s article relates to the abuse of UN facilities by terrorist organisations but notably no information is provided to audiences concerning the investigators’ conclusions as to why and how that abuse came about. “He [the UN Secretary General] also expressed dismay that Palestinian militant groups would put UN schools at risk by using them to hide arms. The report found that weapons were stored at three schools, although they were not being used as shelters at the time. The inquiry found that Palestinian militants had probably fired from two schools, which Mr Ban said was “unacceptable”. 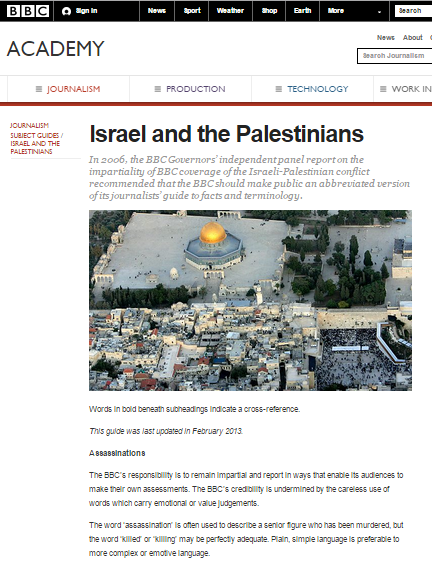 A third part of the article gives the BBC’s version of the section of the report which relates to Israeli actions and remarkably all the important background information and context included in the report summary (such as the location of certain sites within the buffer zone and prior warnings to evacuate some facilities) is removed from audience view. “At least 44 Palestinians were killed by “Israeli actions” while sheltering at seven UN schools during last summer’s war in Gaza, a UN inquiry has found. In one incident, a girls’ school was hit by 88 mortar rounds fired by the Israeli military, the summary said. Another girls’ school was struck by an anti-tank projectile, while a third was hit by a missile. At a fourth girls’ school, the inquiry found, “no prior warning had been given by the government of Israel of the firing of 155mm high explosive projectiles on, or in the surrounding area of the school”. The report summary deals with ten separate cases, three of which relate to the storage of weapons by terrorist groups in UN schools. Of the remaining seven cases, one relates to a boys’ school and two to co-educational facilities, meaning that the remaining four incidents at girls’ schools – the four the BBC chose to highlight – are, according to the classification used in UN’s report, Incidents a, b, d and e.
As readers can see for themselves in the summary, in none of the descriptions of incidents which took place at girls’ schools (or any others) does the UN investigating body state that a “school was hit by 88 mortar rounds fired by the Israeli military”. “81 MM” of course relates to the caliber of the mortar round – not the number fired. Apparently whichever member of the BBC’s staff read the UN’s summary and then wrote up this article did not understand what he or she was reading. Clearly a prominent correction needs to be made to this article. 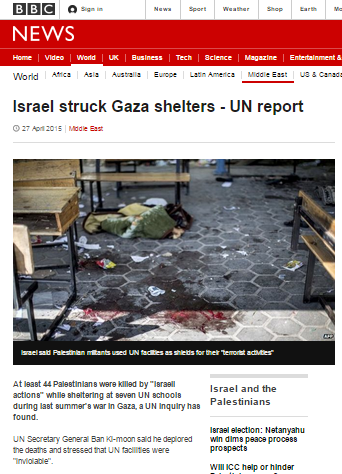 Seeing as at the time the BBC provided a very generous amount of air-time and column space (see just a few examples here, here and here) for UNRWA officials to insist that the names and coordinates of buildings had been passed on to the IDF and to infer malice on Israel’s part, audiences should obviously have been informed that the UN investigation found that the system was by no means foolproof. “The phrase ‘Occupied Territories’ refers to East Jerusalem, the West Bank and strictly speaking the Golan Heights. However, it is common usage for this phrase to refer to the West Bank as a whole and not the Golan Heights (unless it is in a story specifically on the 1967 War or Syrian/Israeli relations). Apparently though, no comparable instructions are available to BBC journalists writing about Cyprus – at least if an article which appeared on the BBC News website on April 26th under the title “Mustafa Akinci wins northern Cyprus presidential election” is anything to go by. The word ‘occupied’ did not appear in that report at all: readers are merely told that Turkey ‘controls’ the northern part of Cyprus. No mention is made of the fact (noted in the BBC’s Cyprus profile) that the only country to recognize the Turkish Republic of Northern Cyprus is Turkey and of course there is no reference in the report(or the profile) to “illegal settlements” or “international law” despite the fact that it was Turkish state policy to facilitate and encourage the immigration of Turkish nationals to the island during the latter half of the 1970s. Can it really be that the BBC has only issued specific guidelines on the ‘correct’ terminology to be used when reporting on one of the world’s many conflicts? Those who clicked on the link to the report itself were greeted with no less ambiguous punctuation, which must have left audiences wondering if the BBC was in doubt about the people killed having really been ‘militants’ or whether it wasn’t sure that they were actually dead. 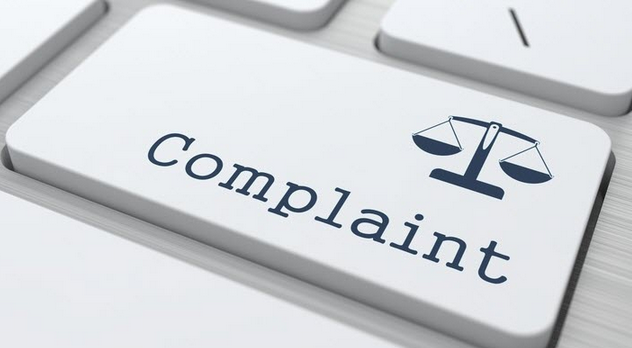 Similar qualifying punctuation – intended to communicate to readers that the BBC distances itself from statements made and/or terminology used – was seen in the body of the report and in the caption to its illustrative photograph. So what were BBC audiences told about the incident which took place at around 21:30 on April 26th? “An Israeli air strike has killed four militants armed with a bomb along the Israeli-Syrian frontier in the Golan Heights, the Israeli military has said. A spokesperson said “terrorists” had been planning an imminent attack on Israeli troops, and that the Israeli air force had “neutralised” the threat. Military sources said the militants were spotted placing explosives on a fence near Majdal Shams on Sunday. In Sunday’s incident, Israeli troops observing the demilitarised zone between the Israeli-occupied Golan Heights and Syria noticed four figures reportedly trying to place an explosive device on the fence along the frontier. An Israeli air force plane was scrambled and fired a missile at the militants, killing them all. 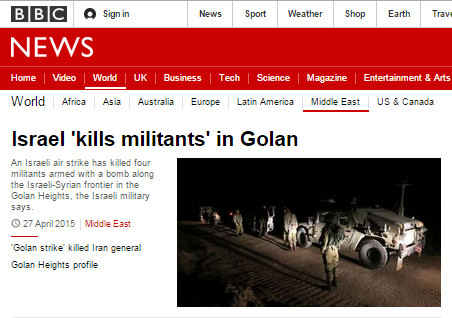 In addition to the fact that – contrary to the BBC’s claim – the terrorists have apparently been identified by pro-Assad activists and others as Syrians and a Hizballah-linked group has claimed responsibility for the attack, the report crucially fails to clarify to readers that the incident took place in Israeli territory. 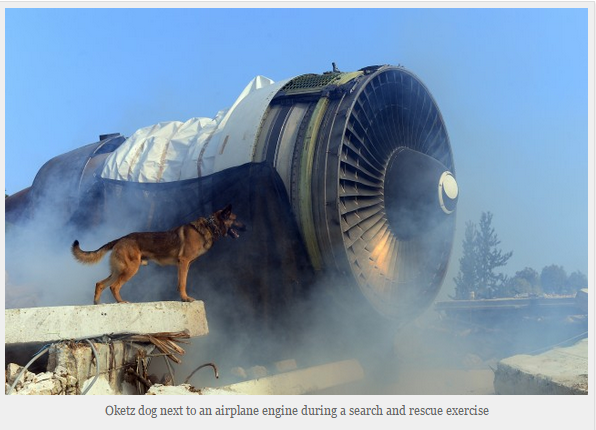 “The incident is fairly local, and is under control,” the source said. Part of this article is devoted to other incidents in the wider region. “Hours later, missile batteries operated by Hezbollah and the Syrian army in the Qalamoun Mountains, near the border between Syria and Lebanon, were reportedly attacked. Al-Jazeera attributed the strike to the Israeli military, but Israeli media quoted sources as denying the report. A source in the Israeli defence establishment told Haaretz that there had been fighting in the area between Syrian government forces and jihadist militants from al-Nusra Front, al-Qaeda’s affiliate in Syria. Israel had no interest in getting involved in the conflict between the two sides, he added. The IDF spokesperson’s office would neither confirm nor deny the report. Beyond repeating the unconfirmed claims made in assorted reports from Al Jazeera and Al Arabiya, the BBC has no concrete information to provide to its audiences. 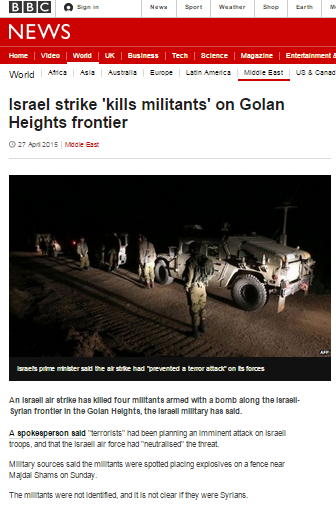 Notably, no effort is made to clarify to readers that the fighting in the Qalamoun area is a fact rather than just something said by an Israeli “source” and only those who clicked on the link to Ha’aretz (and got past the pay wall) would have come across the following information contradicting the Al Jazeera claims which the BBC chose to amplify. Of course many members of the “Arab media” in the region indulge in agenda-based reporting and the Qatari outlet Al Jazeera is a prime example of that phenomenon. Before amplifying unverified claims, the BBC would obviously do well to bear in mind that some of the governments behind various “Arab media” outlets also play a role in supporting assorted factions involved in the Syrian civil war. 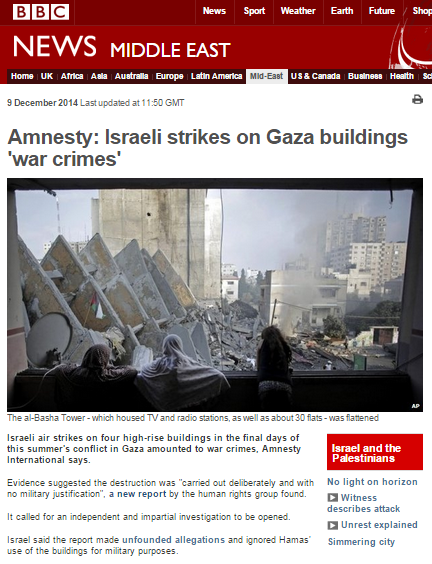 As has been noted here before, less than twenty-four hours after the commencement of Operation Protective Edge in July 2014 the BBC began promoting to its audiences worldwide the notion that Israel was committing ‘war crimes’ in the Gaza Strip. That accusation – along with related ones such as ‘crimes against humanity’, ‘deliberate targeting of civilians’ and ‘collective punishment’ – continued to be a theme found in BBC coverage throughout the fifty-day conflict and since its conclusion, despite the fact that its origins were to be found in statements from politically-motivated NGOs concurrently engaged in ‘lawfare’ against Israel and in amateur speculations from BBC journalists. 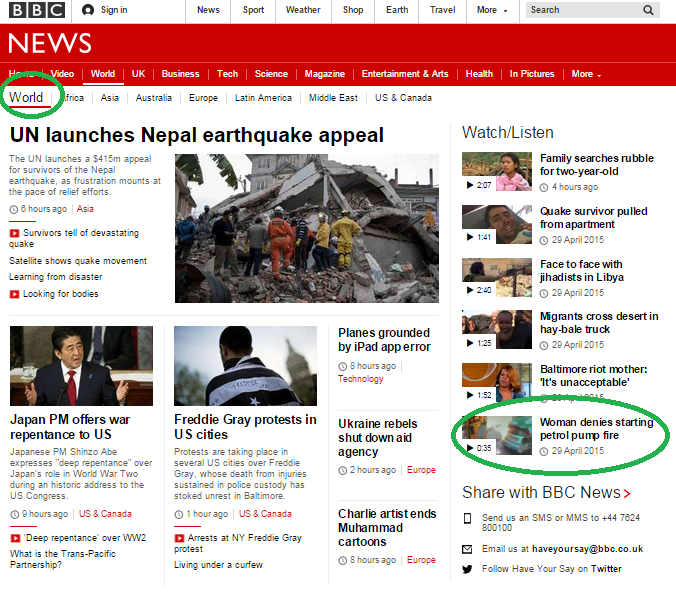 Of course much of that material is still available to the general public as ‘permanent public record’ on the BBC News website and no attempt was made – either at the time or since – to provide audiences with impartial professional commentary on the topic of the Law of Armed Conflict which would enable them to reach informed opinions on the topic. The BBC’s continuing failure to show any interest whatsoever in bringing its audiences such professional perspectives to balance the politically motivated messaging it propagated during the conflict and in the months since its end does nothing to reassure licence fee payers that it is committed to accurate and impartial reporting. 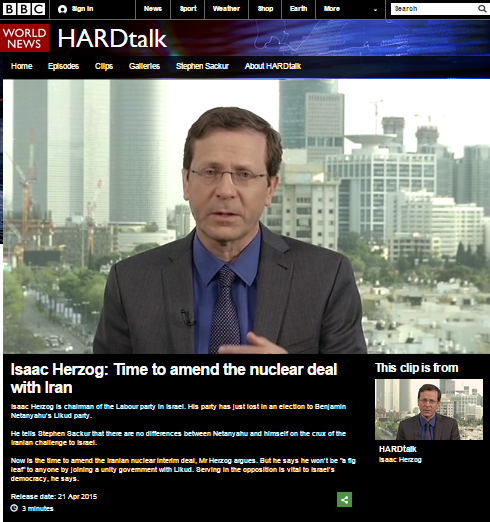 The April 21st/ 22nd edition of ‘Hardtalk’ featured an interview with the leader of the Israeli Labour party, Yitzhak (Isaac) Herzog. Readers in the UK can find the programme on BBC iPlayer here and a podcast of the programme is available here. As is not infrequently the case, viewers and listeners heard presenter Stephen Sackur promoting his own ideas about Israel in the form of ‘questions’ and even some belated election campaign advice to Herzog. One particular section of the interview was also promoted by the BBC on social media under the title “Isaac Herzog: Time to amend the nuclear deal with Iran” and with the following synopsis. 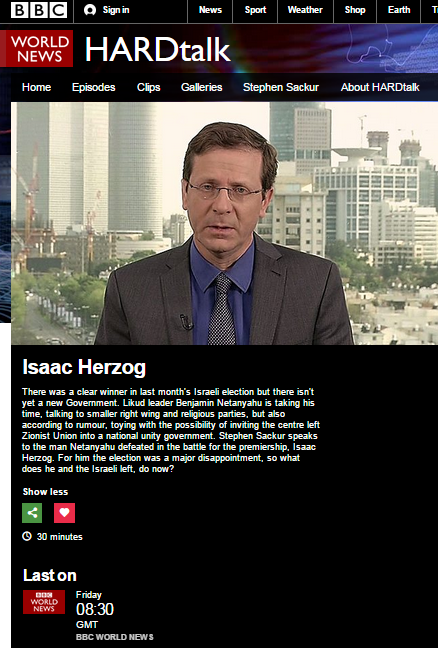 “Isaac Herzog is chairman of the Labour party in Israel. His party has just lost in an election to Benjamin Netanyahu’s Likud party. He tells Stephen Sackur that there are no differences between Netanyahu and himself on the crux of the Iranian challenge to Israel. Whilst Herzog’s stance on the P5+1’s framework agreement with Iran will not come as a revelation to those with a realistic understanding of the Israeli political scene, it does shine a spotlight on the framing chosen by the BBC in its presentation of the issue in recent weeks. That choice of framing has led to a failure to clarify to BBC audiences that concerns regarding the Iranian nuclear programme straddle the Israeli political spectrum and are not – as BBC audiences have been led to believe – the exclusive concern of the Israeli prime minister. Stephen Sackur, however, was too focused on the niche topic of coalition building to take the opportunity presented by Herzog’s words to contribute to the BBC’s public purpose remit by clarifying to audiences worldwide exactly why two Israeli leaders with such different views on so many other issues see the same pitfalls in the framework agreement. Late on the night of April 24th an incident took place at a checkpoint on Highway 1 leading into Jerusalem. A police officer was wounded in rioting which followed the incident. On April 25th another incident took place in Hebron. “A Palestinian man stabbed an Israeli Border Police officer in the West Bank city of Hebron Saturday, inflicting moderate injuries. The alleged attacker, aged 20, was shot and wounded, and died of his injuries on the way to a hospital in Jerusalem. Later the same evening three more police officers were injured in another attack. “Three Israeli police officers were injured Saturday evening when struck by a car on the Mount of Olives in East Jerusalem in what authorities suspect may have been a deliberate attack. A suspect was later arrested. Police are also investigating a suspected fire-bombing of a bus on Route 443 on the evening of April 25th. None of the above was deemed newsworthy by the BBC. Some social media commentators have incorrectly claimed that the BBC has failed to report on Israeli aid to Nepal in the wake of the devastating earthquake in that country. 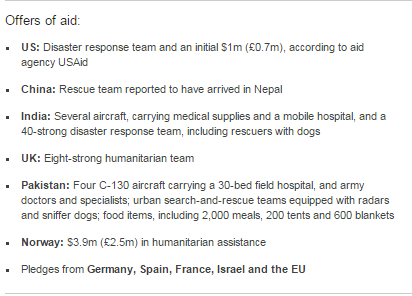 In a report titled “Nepal earthquake: Death toll passes 1,000” published on the BBC News website on April 25th the BBC included Israel in its list of countries described as having pledged aid. 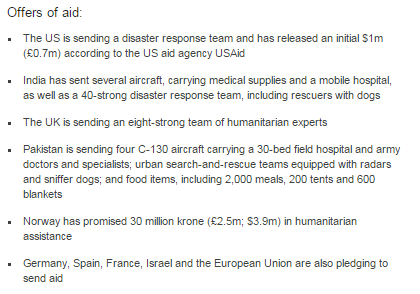 Similar phrasing appeared under the sub-heading ‘Offers of aid” in an article titled “Nepal earthquake: Rescue effort intensifies” which appeared on April 26th. However, by the time that second report was published an Israeli reconnaissance team had already set out on the twelve-hour journey to Nepal. “An Israeli plane carrying an advance search and rescue team and emergency medical supplies took off for Nepal early Sunday morning, as the death toll in the wake of a massive earthquake that shook the region climbed toward 1,400, officials said. In addition, a team of Magen David Adom paramedics departed for Nepal on the morning of Sunday, April 26th. After the strong quake hit the area, Magen David Adom decided to send a delegation of doctors and paramedics, in coordination with the International Committee of the Red Cross. The team set out in a special plane equipped with medicine, medical supplies and baby food. They intend to stop at the Chabad House in Kathmandu, where many Israelis –both adults and infants – took refuge. Later on Sunday a larger IDF team will also travel to Nepal. In addition to the field hospital, a search and rescue team will work in the affected area. So, whilst the BBC’s description of the pledge of aid from Israel is accurate, it of course does not reflect the fact that practical steps have already been taken to turn that promise into action. Our many readers with a keen interest in Israeli history will no doubt enjoy this recent Independence Day programme from the Voice of Israel.